Code 38b Cuirassier in continental helmet, cuirass over coat, galloping. 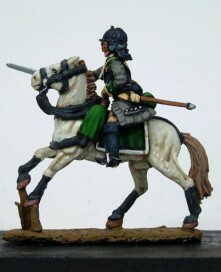 Painted as a Bavarian Cuirassier. A fascinating article written by a Professor who describes his part in perhaps the last `brigade size' cavalry charge in history which took place in September 1939 in Poland - Well worth a read. The last charge - a rebuff? A considered piece of research by John Boadle on an article I discovered on the web about a massed cavalry charge in Poland on September 8 1939. Well worth a read!